Paul Gauguin paintings, portraits and parallels add up to strong objective proof of reincarnation, artist Peter Teekamp says. Why couldn't I be Michelangelo? Dutch-born American artist and muralist Peter Teekamp's story reads like pure fiction. 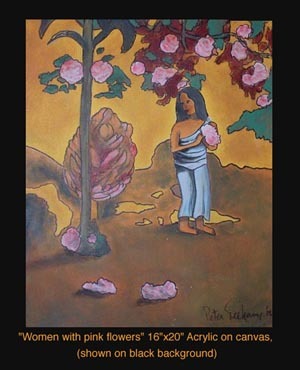 His 35-year art collection and history points to the reincarnation of Paul Gauguin. My name is Peter Teekamp. I am a Dutch-born American Artist and Muralist with a story that reads like pure fiction. I can't take credit for the 'too-good-to-be-true' story that happened to me, yet it is all verifiable through my 35-year art collection and history. It starts with a near-death drowning as an infant, follows with a lifetime of art, an abundance of strange coincidences and one very painful experience about thirty years ago. 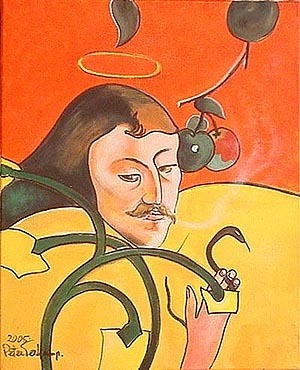 The result was a discovery of hidden faces I found in the artwork of the famous artist Paul Gauguin. Since I had also been hiding faces in my own art for years, I suppose you could say it was a 'trained eye' that made them easy to recognize. During my life I was told by different people, including psychics and clairvoyants, that I was Paul Gauguin and my roots were in France. My first reaction was to think to myself "Why couldn't I be Michelangelo?" 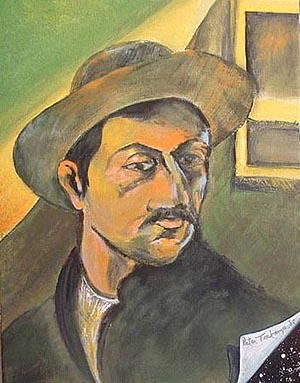 There were so many incidents that seemed to connect me to the controversial Gauguin from the simple occurrence of a book falling from its shelf and landing at my feet, opened to the pages of Gauguin, to the town of St. Cloud where we both began to paint seriously, Gauguin in St. Cloud France and me in St. Cloud Minnesota, to the undeniable fact that we look alike. In 1991, I found a co-author to help me write my story and work to find a publisher. In 1998, one of the first to read the manuscript was Nick Bunick, Author "The Messengers: A True Story of Angelic Presence and the Return to the Age of Miracles" whose story speaks of the reincarnation of the Apostle Paul. Mr. Bunick wrote and said "You have a wonderful story and should share it with others." In 2003, I stumbled into the most amazing coincident of all. I found and purchased a one-hundred and thirteen-year-old original Gauguin charcoal drawing. 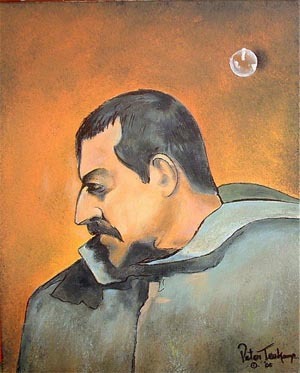 Since I was also finishing my manuscript about my connections with Gauguin and my discovery of his hidden faces, the situation sounded so unbelievable that authenticating the drawing became nearly impossible. I know in time, with the help of forensic science, the drawing's validity will be proven. Now in 2005, some of my art hangs in the cafe made famous by the T.V. series Twin Peaks, I have a website that shows my murals from around the world, a website for my story and gallery of art as well as a newly-opened eBay store. This summer I was invited to meet a group of respected and internationally known doctors, chemists and researchers who gathered for the purpose of scientifically proving reincarnation. Telling my story to this group and hearing their own personal evidence confirmed to me stronger than ever before that my past life match was indeed Paul Gauguin. I was asked by Dr. Walter Semkiw, author of "Return of the Revolutionaries, the Case for Reincarnation and Soul Groups Reunited," working close on dozens of cases with Trance Medium, Kevin Ryerson, author "Spirit Communication, The Soul's Path," "Can you paint like Paul Gauguin as well? That may complete the picture and help add even more objective evidence for your case." To that question I had to answer "Why not?" Why not if it helps make the point? 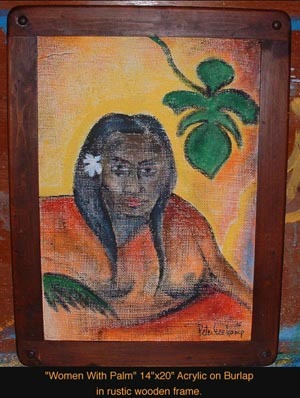 Gauguin believed in reincarnation and even made predictions about his return. Maybe my role is to paint the evidence of my own reincarnation. 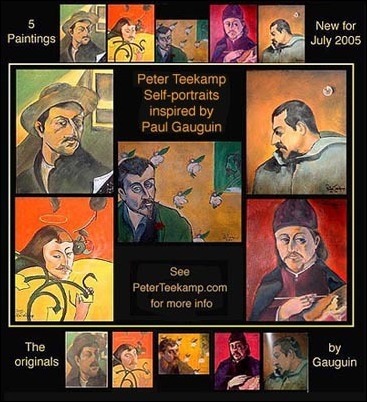 As a result of the Doctor's question, I am introducing the first Teekamp Self-Portraits and paintings inspired by Paul Gauguin (and calling it, what else? The "No More Denial" Collection). I am searching for a publisher, producer and/or art dealer. My manuscript, "Reincarnation for Dummees? 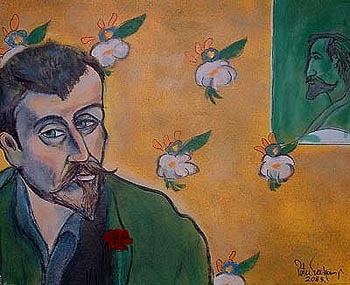 When the evidence is in-your-face" (formerly titled; "Pass It On, Art HIStory") documents the colorful true story, examines two lifetimes of art, exposes Gauguin's hidden faces, lists the parallels between Peter and Paul and the ongoing research for the century-old original Gauguin charcoal drawing. I hope you find this of interest. Please call or email me. I'd love to hear from someone who sees the possibilities. 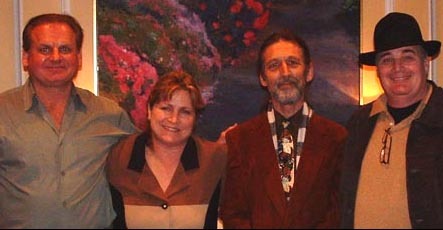 Dr. Walter Semkiw, Michelle Moshay, Peter Teekamp, Kevin RyersonPortland, January 2004 "Holy Smokes" Teekamp self-portrait inspired by Gauguin "With Bubble" 2005 Teekamp Self-portrait inspired by Gauguin. "With Galaxy" 2005Teekamp Self-Portrait inspired by Gauguin "With Rose" 2005Teekamp Self-Portrait inspired by Gauguin "With Rainbow Palette" 2005Teekamp Self-Portrait inspired by Gauguin "Women with Palm" 200514"x20" wood framed Teekamp acrylic on burlap painting, inspired by Gauguin "Woman with pink flowers" 200516"x20" acrylic on canvas Teekamp painting, inspired by Gauguin.